40 Watts: Illuminating Herstory opens at the Pacific Art League – Norton Gallery with an Artist Reception on Friday, April 6, from 5:30- 8:30 pm. Exhibition dates are April 6-27, 2012. 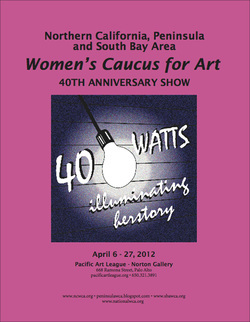 40 Watts: Illuminating Herstory is a collaborative exhibition between the Northern California, Peninsula and South Bay Area chapters Women’s Caucus for Art to celebrate the WCA 40th Anniversary. Esteemed member, Eleanor Dickinson begins her essay about WCA’s history by writing, “The Women’s Caucus for Art was born in anger and nurtured by challenge and innovation….” Drawing from the foundations of our past forty years, with the fragile, dim beginnings strengthened by the non-apologetic voices of women artists that sought to create change, the exhibition investigates the diverse voices of women artists and the depth and breadth of work being created. Multiple generations of women’s art are represented and within the selection are myriad formations of feminist thought and aesthetics. The works are also a testament to the drive that propelled them and their work forward - their experiences and their history. Exhibiting Artists are: Jill Andre, Salma Arastu, Deanna Beye, Gretchen Blais, Rhoda Bloom, Darlene Boyd, Lorraine Capparell, M.C. Carolyn, Starr Davis, Cosette Dudley, Kalani Engles, Kathy Fujii-Oka, Karen Gutfreund, Kelly Hammargren, April Hankins, Trudi Chamoff Hauptman, Rozanne Hermelyn Di Silvestro, Kristine Idarius, Patricia Keefe, Ellen Kieffer, Katherine Kodama, Susan Kraft, Rebecca Lambing, Ellen Lee, Marie LaPrade, Lynn Letterman, Nancee McDonell, Alysanne McGaffey, Trudy Myrrh, Priscilla Otani, Jane Peterman, Sally Rayn, Ally Richter, Shizue Seigel, Judy Shintani, Bonnie J. Smith, Pamela Spears, Lynne Todaro, Leigh Toldi, Cristina Velazquez, Tanya Wilkinson, Marian Yap. The Women's Caucus for Art was founded in 1972 in connection with the College Art Association (CAA). It is a national member organization unique in its multi-disciplinary, multicultural membership of artists, art historians, students, educators, and museum professionals. The mission of the Women’s Caucus for Art is to create community through art, education and social activism. We are committed to recognizing the contribution of women in the arts, providing women with leadership opportunities and professional development, expanding networking and exhibition opportunities for women, supporting local, national and global art activism and advocating for equity in the arts for all. For more information visit: www.nationalwca.org. Mission Statement: “To provide an environment for advancing the expression, appreciation and enjoyment of the arts.” Pacific Art League – Norton Gallery is located at 668 Ramona Street, Palo Alto, CA 94103.